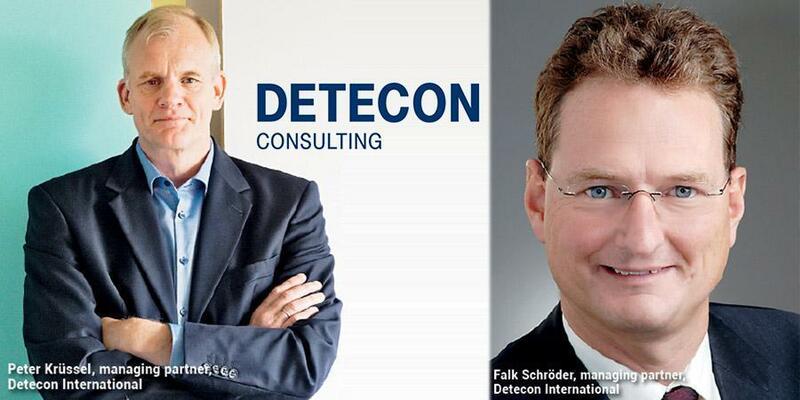 As a "hidden champion" of digitalization, Detecon International, a leading German management and technology consultancy, becomes 40 years young (founded 7/7/77). They are Deutsche Telekom Group's own management consultancy that guides national and international clients, including many telecommunications companies, through the process of digital transformation. In an interview with Telecom Review, Peter Krüssel and Falk Schröder, managing partners at Detecon International, talked about how they are helping companies to improve their performance and get them closer to digitization and 5G deployments. How does Detecon help companies to improve their performance? Krüssel: We advise telcos as they seek to master the key challenges facing them. Telecommunications companies are confronted essentially with four great challenges. First, data traffic is rising, and in some cases exponentially. This leads to greater volatility of the traffic on the networks, strains the networks to the limits of their capacities, and affects the quality perceived by customers. The telcos are attempting to master this challenge by deploying new technologies and expanding capacities and network coverage. We believe that the issue involves more than just the technological aspect. The question of data volume also affects the competition among the carriers. It has the potential to increase the pressure on the industry toward greater consolidation. Only integrated carriers operating both fixed and mobile networks have a chance to meet future demands. Carriers operating only a mobile network will have difficulty handling the future traffic volume, quality requirements and sophisticated demands while maintaining the required level of quality. Telcos must respond to these circumstances. Detecon provides support during the definition of market positioning strategies appropriate to the situation for the derivation of the right network expansion strategy, and for the selection of the right network technologies and architectures. Second, competitive pressures from "over-the-top" providers, the OTTs, continue to rise. Carriers have already suffered tremendous losses in service revenues. These revenues have not been shifted to other areas - they have simply vanished. As a rule, the OTTs offer these services free of charge and refinance their operations through data-centric business models. Besides the loss of service revenues, e.g. in messaging and voice services, there is, however, also the threat of revenue losses in what is actually the core business or the supposed core asset: access and connectivity. Even now, OTTs are offering these services on the market. Examples are Google Fi in the USA or Amazon's activities as the reseller of mobile service contracts in Germany. Telcos are at risk of relinquishing their position as independent services in the minds of customers and, sooner or later, of losing their contact to end customers. If this happens, they will ultimately be nothing more than data transmission companies, wholesale providers and suppliers to the OTTs. We advise telcos during the development of appropriate counter-strategies and in the strengthening of customer relationships. Third, the decline in prices in telcos' core services, i.e. internet access and voice, continues to dominate the markets. Access is perceived to be a commodity while the service level is provided to end customers free of charge by OTTs. Telcos are faced with a double-edged problem. On the one hand, they must invest enormous sums of money in their networks to handle the exponentially rising traffic while, on the other hand, they are struggling with declining revenues. Detecon supports its telco clients in securing earnings through innovative products and services, partner strategies and intelligent, segment-specific rate models. Fourth, telcos must deal with the restrictions of regulation. OTTs currently enjoy advantages here because they are not subject to the same regulation as telcos even though they offer services similar to those of the carriers. The ultimate goal must be to ensure that services such as voice and messaging are subject to identical regulation requirements irrespective of the provider, whether a telco or an OTT. In your opinion, what kind of business models should corporations adopt in order to approach digitalization? Krüssel: Digitalization is simultaneously a challenge and an opportunity for telcos. It heightens competition and, at the same time, is a source of possible solutions for the challenges described above. One thing is certain: digitalization significantly lowers the barriers to entry in markets that have previously been protected. There are examples of this from several industries. In the financial sector, established banks are facing competition from such services as Apple Pay or Bitcoin. In the travel industry, providers such as Airbnb have caused major shake-ups in the hotel sector. Traditional telcos have found themselves confronted by new competitors like this for some time now. Apple FaceTime, WhatsApp or Skype are only a few examples. These competitors all come from a completely different environment. How can telcos respond to the OTTs? One way is to emulate the latter's business models, production methods and best practices in the design of digital interfaces to the customers. For instance, OTTs as a rule offer their services from only a few international play-out centers, in some cases even a single one. From here they serve their customers around the world. This platform-oriented, central approach to new services has an enormous advantage because a critical mass can be achieved relatively quickly. And often enough, the final result is this: the winner takes it all. Some OTT services have more or less a worldwide monopoly. Telcos, however, must digitalize their own operations to become more efficient and increase their revenues, i.e. to mine the potential inherent in digitalization. This puts telcos on the horns of a dilemma. While they are dealing with themselves and their own digitalization, they must at the same time respond quickly to market pressures and are expected to provide the platform for the digitalization of other industries. Not a simple task. Moreover, digitalization affects all of the added-value stages of the telcos, from technology to IT and process landscapes to marketing, sales and services. So, telcos must consider all interfaces: to customers, to partners and internally - a daunting and complex task. How are changes in consumer behavior driving further developments in the telecom sector? Krüssel: Individualization, emotionalization, security, mobilization, convenience, quality, digitalization of the customer interfaces are important changes in customer behavior or in customer expectations that we are observing. They bring the subject of "segment of one" and personalization of services to the forefront. Customers expect companies to know them very well and to pick them up again, for instance, at the point where they last left the customer journey. In brief, they expect a seamless customer experience line across all online and offline channels. Moreover, the subject of mobility is becoming more and more important. There will be completely new touch points with customers in the future because of the internet of things and the ubiquitous connectivity of all kinds of devices. Just one example is the order buttons for consumption goods that will be found on consumer products, whether refrigerators, vacuum cleaners or washing machines. Soon it will be possible to order a new supply of detergent, conveniently delivered straight to the home, just by pressing a button on the washing machine. This will simplify or shorten the entire customer journey or the buying decision process and satisfy the desire for convenience. Customers will not even have to access a web shop. They will have nothing more to do with the selection of the retailer or product or with price comparisons. The designated shop will do that automatically. It will know which detergent is used, compare prices and purchase the product where it is the cheapest. Consumers will no longer need a shopping basket in an online shop or an online account. They will just press a button, and the product will be delivered. Telcos must also exploit more fully the edge they hold in competition with OTTs. In the past, telcos believed that they could always fall back on their core business if all else failed, regardless of the competitive situation. They had a secure fortress, so to speak, access to the network. We are safe from attack here, that was the creed. Before long, even the OTTs will be able to simulate network access themselves. The vehicle is provided by so-called resale or MVNO agreements, the eSIM, or in the future, network slicing technology. What does this mean? The network operator will no longer be visible to customers. Here at Detecon, we call this fate the "OTT Big Player Dominance". From the telcos' viewpoint, this is a worst-case scenario. Integrated carriers must set their sights on other targets. They must remain present in the eyes of customers, and they will no longer be able to use an emotionless product such as network or access alone to achieve this. Whether they like it or not, they must maintain a presence by offering services that the OTTs cannot provide. For instance, they can score points with security, privacy, smart home services, local content and customer services. Many customers are more likely to put their trust in the national players and national legislation when they consider these points. What kind of challenges do you face when it comes to network deployments in different spectrum bands? Schröder: 5G requires a very close-meshed network of radio antennas because 5G - during the first phase, at least - operates in the higher bands, a frequency range that presumes a greater density of antenna sites to provide full-area coverage. While we have been operating so far at distances of a hundred meters, the distances in the future will have to be substantially shorter. We are assuming a network density that is significantly below 100 meters. So the question arises: How will a carrier manage to build such a close-meshed network? It will not be possible without support from politics and from cities and communities. Even today, it is very difficult to find locations for antennas. One issue is resistance from citizens, but technical restrictions also come into play. Every antenna must have an electrical connection and, ideally, be connected to the fixed network by optical fiber. How do I transport a high data load to the antenna? If optical fiber cables must be laid everywhere, the expense will be high. That cannot work without partners. Moreover, the synchronization within the dense network of antenna locations must be excellent if harmful radio interference is to be avoided and the required network quality is to be assured. This can only be mastered by the use of new technical methods that are highly automated. So the rollout of the network must be slow. Telcos must initially concentrate on cities and define a sensible sequence for the order in which the centers will be served. There will then be a very high download/upload rate to serve customers in the cities while LTE will remain the available mobile network standard in rural areas over a period of at least five to 10 years. Once the lower frequency ranges have been cleared for 5G, 5G can be rolled out cost-effectively in rural areas as well because of the lower demands for density of the antenna locations. And finally, telcos must be able to operate an end-to-end network as well, to feed in and test automatically new functions, and to re-activate old services. So, there are many different requirements that not every carrier can fulfill right away. What are the latest trends in 5G development? Schröder: You must note that 5G is not a simple network expansion. It is not only a mobile network standard that allows us to move faster, higher and farther. It is far more. 5G gives rise to an architecture that can be adapted to consumers' needs with great flexibility. Everything is based on software, and so new applications can be integrated quickly - services in NB IoT with low data volume from the deep corners of the basement of a house to high-load applications such as those in virtual and augmented reality applications, for instance. All of these requirements, which are characterized by their great diversity, can be met by a single network. That is what is truly new about 5G. What does this mean from the telco perspective? The operator will no longer sell a general SIM card for voice and data. The sale will be specific to the scope of utilization, to the desired latency time. Telcos must understand this and set their pricing so that they offer customers a price model at reasonable cost. They will not be able to offer a latency time of less than one millisecond to every customer because this would mean having an edge server at every single antenna. That is too expensive and for security reasons alone not possible. One interesting aspect is network slicing. Using 5G, a telecommunications provider can offer specific network capability and the corresponding capacity to its customers in slices. Single customers can utilize network resources reserved for them for specific requirements and for their own applications along with the service features to be performed using these resources that are bundled into so-called slices. Using standardized interfaces, it is even possible for customers to administer the slices themselves to a certain degree. So there will be slices for various services, for NB IoT, high-end users with the corresponding data rates (self-driving cars, for example), or for AR/VR applications. Because of the many and diverse applications that are to be expected, it must be possible to connect them to the network automatically and to handle them flexibly during the operational lifecycle. That is why the demands on automation and on reliability in network operation itself are very high. How will the future be shaped differently with 5G New Radio? Schröder: First of all, we must understand what customers want. Take a look at the automotive sector. The future customer will no longer be John Doe who drives a certain car and uses certain services for this vehicle. The car-makers themselves will be the customers who will equip their entire fleet with certain functions (entertainment, but also digital maps on request), e.g. an eSIM, to support certain operations in the car. The cars will themselves become small datacenters that do not belong to the carrier. Let's look at autonomous driving. It will be possible to swivel the seats. I can turn my seat around and hold a video conference on the rear seat back. Or I will receive information about my current location. A telecommunications company will need to ask itself what a car must be able to do - for car2car communication, for example. This is possible using a back end with servers with high latency times, or I use an edge server with low latency times, but that will probably not be exactly cheap. Or I transmit small data volumes directly from car to car. In that case, a telecom car must also be able to transmit data to a Vodafone car. Otherwise, cars will not be able to notify one another about danger points. The telcos will have to ask themselves where they get the money for these services because they must make applications and a certain level of quality available. This will change business models because the provider must know what added value costs how much. This requires an end-to-end analysis and no longer a business case approach. It is not easy to understand how this is supposed to function at the end of the day. We must first understand the business model. And we are not yet there.